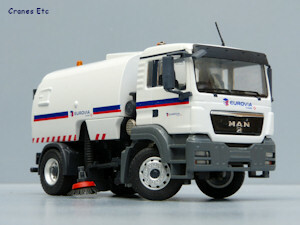 MAN TGS 4x2 + Bucher Schörling CityFant 6000 - Eurovia Video. Wander hose clipped in place. Channel brush extended for sweeping. 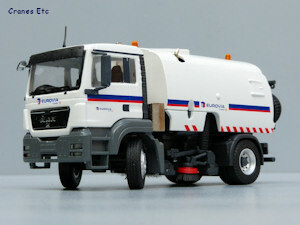 Looks good as part of a Eurovia diorama. Bucher Schörling has a very long history stretching back to when it began as a blacksmith business in Switzerland in 1807. 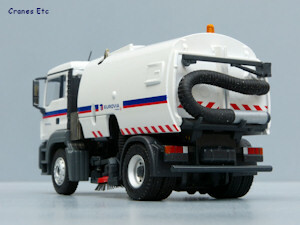 It is a leading manufacturer of municipal vehicles for cleaning purposes. 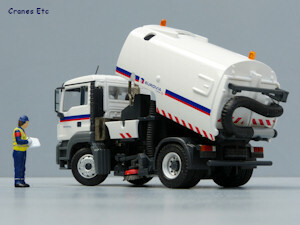 This version of the CityFant 6000 is mounted on a MAN TGS 4x2 chassis (although the specs for the real machine list a MAN TGM chassis) and it has a gross vehicle weight of 15 tonnes. This model has been given an 'L' series designation in the Conrad numbering system which indicates reduced functionality and in this case it means the cab does not tilt. 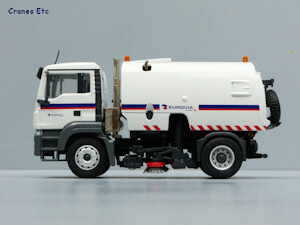 The model in the colours of Eurovia which is a subsidiary of the VINCI Group. 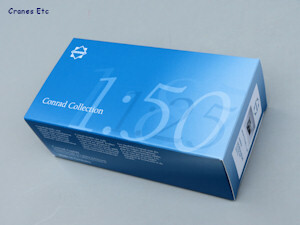 The model comes in a Conrad branded box. The model is wrapped in foam rubber. It had no defects or missing parts. There is no information about the real machine and there are no instructions for the model. The only assembly is to fit door mirrors and a roof aerial. Underneath there is detailing of the rear axle but because of the sweeping gear there is no drive shaft from the engine end. The sweeping gear is interesting and includes real brushes. At the front the steering is modelled in a purely functional way. 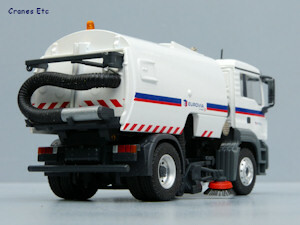 The tyres are the same front and rear, and the wheels are detailed. The rear lights are painted but there is no number plate and it would have looked better with one. The MAN cab is pleasantly modelled with nice lights and plain mirrors. The door handles are highlighted with paint although the steps have a smooth surface. 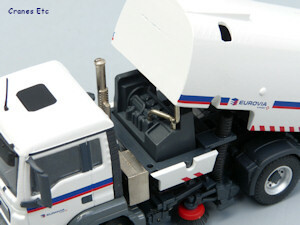 The interior detail is reasonable and the Eurovia livery is nicely applied. Immediately behind the cab is a metal exhaust system. The hopper is metal and feels robust. It has beacon lights front and rear and the slot for exhaust air is nicely formed. At the rear there is a large wander hose although it is not fixed to the gantry (which is a non-functioning part on the model). 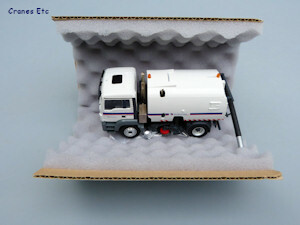 Under the hopper is a plastic engine which is moderately detailed. 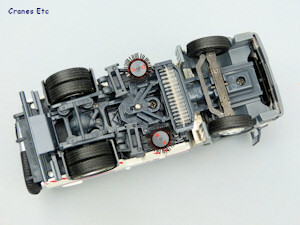 The steering works very well with an excellent range of movement. 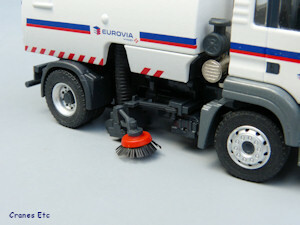 The main sweeping brush pivots from side-to-side and up and down. Each round channel brush rotates and can be extended out and raised and lowered. The wander hose is removable from the rear although it is difficult to pose in a realistic way because of the springiness of the hose. The hopper tilts. It was stiff on the review model and extending it too far results in the ram piston exiting its sleeve, although resetting it is not difficult. This is another solidly made Conrad model, with a good finish and the graphics are sharp. 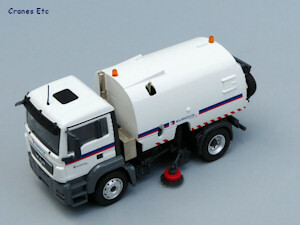 Conrad has produced a nice version of an industrial sweeper and the sweeping equipment is nicely modelled with good functionality. 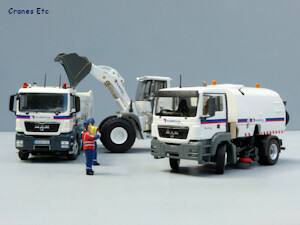 It is good to see it in Eurovia livery as it goes well with other Eurovia liveried models. This version of the model first appeared in the VINCI shop in July 2013 and was a run of 250 models.